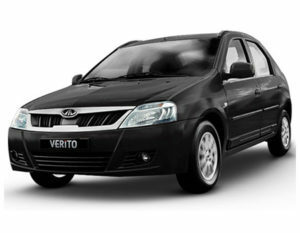 The Mahindra e-Verito is powered by a 3-phase 72V induction motor that promises 30.5kW of power and 91Nm torque. A single-speed transmission transfers all this power to the front wheels. The 200Ah Li-ion battery in the car powers all the ancillary functions, including the music system, AC and headlamps. It also charges the 12V battery which is used for the start up. Starting the car is also an art in itself. You turn the key, but it doesn’t go all the way like in your conventional fuelled car. 15 seconds after turning the key, you hear a slight noise  a subtle ding from the rear of the car, signalling that the car is ready now. After this audible cue, you have to press the drive button located on the lower right side of the dashboard. At this point, the car starts to creep forward. For further progress, select F on the gear lever and you start to move ahead at a reasonable pace. For an additional boost, shift to the B mode which is the phase that they preferred to be in for the entire duration of my drive. In this mode, you get a slight boost. That being said, even in B mode, the driving experience is quite sedate and I wouldn’t really call it an electrifying. There is the usual gadgetry associated with a Mahindra electric car  Revive, Fast Charge, Boost and brake energy recuperation. Revive gives you an additional bit of range when the charge is very low, about 5km which should be enough to get to a charging point in an urban setting. Then there is Fast Charge that uses a built-in ME fast charging port to reduce the standard charge time of eight hours to just one hour and 50 minutes. There is no special installation required for the Fast Charge. However, this feature is only available on the top D6 model. Brake energy regeneration is part of the package for all the electric as well as some hybrid cars. This ensures that the kinetic energy, which is generated when the brakes are applied, are stored as potential energy to be used in the future. This also includes charging the battery pack.Unfortunately, the lack of ABS and airbags even as an option is a significantly glaring omission.